Eugene Joseph "Gene" McCarthy (March 29, 1916 – December 10, 2005) was an American politician and a long-time member of the United States Congress from Minnesota. He served in the United States House of Representatives from 1949 to 1959, and the U.S. Senate from 1959 to 1971. In the United States presidential election of 1968, McCarthy unsuccessfully sought the Democratic nomination for president of the United States to succeed incumbent Lyndon B. Johnson on a platform openly opposed to the Vietnam War. He unsuccessfully sought the presidency five times. In 1980, McCarthy made a remarkable about-face and endorsed Ronald Reagan for the presidency. However, McCarthy is chiefly remembered for being the first public candidate to speak out against the Vietnam War, and for making this stance the centerpiece of 1968 presidential campaign. Many liberal politicians and citizens credit him being a key figure to start the momentum for arresting United States involvement in the war. However, over two decades of suffering in Vietnam followed withdrawal of the United States under the communist regime that took power. Senator McCarthy graduated from St. John's Preparatory School in 1931. He was a 1935 graduate of St. John's University in Collegeville, Minnesota. McCarthy earned his master's degree from the University of Minnesota in 1939. He taught in various public schools in Minnesota and North Dakota from 1935 to 1940. In 1940, he became a professor of economics and education at St. John's and worked there until 1943. In 1944, Eugene McCarthy married Abigail Quigley. Over the years of their marriage, they had four children, one son (Michael) and three daughters (Ellen, Margaret, and Mary). Daughter Mary died in 1990. McCarthy was a civilian technical assistant in the Military Intelligence Division of the United States Department of War in 1944, and an instructor in sociology and economics at the College of St. Thomas, St. Paul, Minnesota, from 1946 to 1949. McCarthy was a member of the Minnesota Democratic-Farmer-Labor Party. Representing Minnesota's Fourth Congressional District, McCarthy served as a member of the United States House of Representatives from 1949 to 1959, in the 81st United States Congress, 82nd, 83rd, 84th, and 85th United States Congresses. He was not a candidate for renomination in 1958. He went on to serve in the U.S. Senate from 1959 to 1971, in the 86th, 87th, 88th, 89th, 90th, and 91st United States Congresses, and was a member of (among other committees) the powerful Senate Foreign Relations Committee. Eugene and Abigail McCarthy became estranged and separated in 1969. They never divorced. Some say the strain of the 1968 presidential campaign was too much. McCarthy was rumored to have a longterm affair with prominent columnist and journalist Shana Alexander. However, according to Dominic Sandbrook's McCarthy biography, the late CBS News correspondent Marya McLaughlin was his actual extra-marital lover. The long-term relationship lasted until Ms. McLaughlin's death in 1998. McCarthy was a resident of the small community of Woodville, Virginia, for about 20 years in later life. In the end, McCarthy died of complications from Parkinson's disease at the age of 89, on December 10, 2005, at Georgetown Retirement Residence in Washington, D.C. His eulogy was given by former President Bill Clinton. In 1968, McCarthy ran against incumbent U.S. President Lyndon Baines Johnson in the New Hampshire Democratic primary, with the intention of influencing the federal government—then controlled by Democrats—to curtail its involvement in the Vietnam War. A number of anti-war college students and other activists from around the country traveled to New Hampshire to support McCarthy's campaign. Some anti-war students who had the long-haired appearance of hippies chose to cut their long hair and shave off their beards, in order to campaign for McCarthy door-to-door, a phenomenon that led to the informal slogan, "Get clean for Gene." McCarthy's decision to run was partly an outcome of opposition to the war by Oregon's Wayne Morse, one of the two Senators to vote against the Gulf of Tonkin Resolution. Morse gave speeches denouncing the war before it had entered the consciousness of most Americans. Following that, several politically active Oregon Democrats asked Robert Kennedy to run as an anti-war candidate. Initially Kennedy refused, so the group asked McCarthy to run, and he responded favorably. McCarthy has been given credit for being the first public figure to speak out firmly against the war in Viet Nam. His voice began to turn the tide of public policy regarding this war that caused so much public outcry at the time. When McCarthy scored 42 percent to Johnson's 49 percent in the popular vote (and 20 of the 24 N.H. delegates to the Democratic national nominating convention) in New Hampshire on March 12, it was clear that deep division existed among Democrats on the war issue. By this time, Johnson had become inextricably defined by the situation in Vietnam and his handling of it. This demonstration of divided support within his party meant Johnson's reelection (only four years after winning the highest percentage of the popular vote in modern history) was unlikely. On March 16, Kennedy announced that he would run, and was seen by many Democrats as a stronger candidate than McCarthy. On March 31, Johnson announced that he would not seek reelection. Then, McCarthy won in the Wisconsin primary, where the Kennedy campaign was still getting organized. Although it was largely forgotten following subsequent events, McCarthy also won in Oregon against a well organized Kennedy effort. Kennedy then took the crucial California primary on June 4. Robert Kennedy was shot after his victory speech at the Ambassador Hotel in Los Angeles, on June 5. He died early on the morning of June 6. In response, McCarthy refrained from political action for several days. Despite strong showings in several primaries, McCarthy garnered only 23 percent of the delegates at the 1968 Democratic National Convention, largely due to the control of state party organizations over the delegate selection process. After the assassination, many delegates for Kennedy chose to support George McGovern rather than McCarthy. Moreover, although the eventual nominee, Vice President Hubert Humphrey, was not clearly an anti-war candidate, there was hope among some anti-war Democrats that Humphrey as President might succeed where Johnson had failed—in extricating the United States from Vietnam. Although McCarthy did not win the Democratic nomination, the anti-war "New Party," which ran several candidates for President that year, listed him as their nominee on the ballot in Arizona, where he received 2,751 votes. He also received 20,721 votes as a write-in candidate in California. However, even in Oregon where McCarthy had shown his greatest strength, it was the Kennedy forces who had a lasting impact on state politics, contributing Portland Mayor Vera Katz and Oregon Governor Neil Goldschmidt. In the aftermath of their chaotic 1968 convention in Chicago, Democrats convened the McGovern-Fraser Commission to reexamine the manner in which delegates were chosen. The commission made a number of recommendations to reform the process, prompting widespread changes in Democratic state organizations and continual democratization of the nominating process for more than a decade. In response, the United States Republican Party also formed a similar commission. Because of these changes, the practical role of U.S. national party conventions diminished dramatically. The most immediately visible effect of the reforms was the eventual nomination of nationally unknown Jimmy Carter by the Democrats in the U.S. presidential election in 1976. Some have argued that the increased significance of primaries has resulted in candidates who are more nationally palatable than those that might have been chosen in a "smoke-filled room." Others see the changes as a mixed blessing because they may make initial name recognition and money more decisive factors in securing the nomination. After leaving the Senate in 1971, McCarthy became a senior editor at Harcourt Brace Jovanovich Publishing and a syndicated newspaper columnist. McCarthy returned to politics as a candidate for the Democratic Presidential nomination in 1972, but he fared poorly in New Hampshire and Wisconsin and soon dropped out. After the 1972 campaign, he left the Democratic Party, and ran as an Independent candidate for President in the 1976 election. During that campaign, he took a libertarian stance on civil liberties, promised to create full employment by shortening the work week, came out in favor of nuclear disarmament, and declared who he would nominate to various Cabinet postings if elected. Mainly, however, he battled ballot access laws that he deemed too restrictive and encouraged voters to reject the two-party system. His numerous legal battles during the course of the election, along with a strong grassroots effort in friendly states, allowed him to appear on the ballot in 30 states and eased ballot access for later third party candidates. His party affiliation was listed on ballots, variously, as "Independent," "McCarthy '76," "Non-Partisan," "Nom. Petition," "Nomination," "Not Designated," and "Court Order." Although he was not listed on the ballot in California and Wyoming, he was recognized as a write-in candidate in those states. In many states, he did not run with a vice presidential nominee, but he came to have a total of 15 running mates in states where he was required to have one. At least eight of his running mates were women. He opposed Watergate-era campaign finance laws, becoming a plaintiff in the landmark case of Buckley v. Valeo, 424 U.S. 1 (1976), in which the U.S. Supreme Court held that certain provisions of federal campaign finance laws were unconstitutional. McCarthy, along with the New York Civil Liberties Union, philanthropist Stewart Mott, the Conservative Party of the State of New York, the Mississippi Republican Party, and the Libertarian Party, were the plaintiffs in Buckley, becoming key players in killing campaign spending limits and public financing of political campaigns. In the 1988 United States presidential election, his name appeared on the ballot as the Presidential candidate of a handful of left-wing state parties, such as the Consumer Party in Pennsylvania and the Minnesota Progressive Party, in Minnesota. In his campaign, he supported trade protectionism, Reagan's Strategic Defense Initiative (or "Star Wars") and the abolition of the two-party system. He received 24,561 votes. In 1992, returning to the Democratic Party, he entered the New Hampshire primary and campaigned for the 1992 Democratic Presidential nomination, but was excluded from most debates by party officials. McCarthy, along with other candidates excluded from the 1992 Democratic debates (including actor Tom Laughlin, two-time New Alliance Party Presidential candidate Lenora Fulani, former Irvine, California mayor Larry Agran, and others) staged protests and unsuccessfully took legal action in an attempt to be included in the debates. In 2000, McCarthy was active in the movement to include United States Green Party candidate Ralph Nader in the Presidential debates. In 2005, he was listed as a member of the board of advisers of the Federation for American Immigration Reform, a largely honorary post. He remained a prolific writer, and authored several books on a variety of subjects. He was also a published poet. 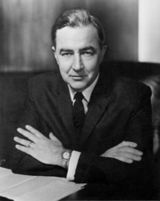 Senator Eugene McCarthy is remembered for being the first public figure to speak out against the Vietnam War and make this stance the centerpiece of his campaign for president in 1968. Many liberal politicians and citizens credit him being a key figure to start the momentum for arresting U.S. involvement in the Vietnam War. Time will tell how history will view McCarthy's stance. Perhaps he was ahead of his time regarding the longing for nonviolent ways to solve problems. Although many Vietnamese civilians suffered atrocities and incredible suffering due to the war and at the hands of the American military, at the time, Vietnam was indeed the front line of the battle against Communism. The fall of Saigon and the South Vietnamese government began a time of deep deep suffering for the people of South Vietnam at the hands of Communist North Vietnam. Perhaps McCarthy's support of Reagan in 1980 was an indication that he had come to understand more about the global picture and appreciated Reagan's strong, unwavering position against Communism. Following McCarthy's death, the College of St. Benedict and St. John's University dedicated their Public Policy Center the Eugene J. McCarthy Center for Public Policy. ↑ PBS, Remembering Sen. Eugene McCarthy—December 12, 2005. Retrieved December 20, 2007. ↑ The Hill, His time was then and now. Retrieved December 20, 2007. ↑ CBS News, Marya McLaughlin Dead At 68. Retrieved December 20, 2007. ↑ James Kilpatrick, Remembering Gene McCarthy. Retrieved December 20, 2007. ↑ College of Saint Benedict Gene McCarthy, Parkinson Disease. Retrieved December 20, 2007. This page was last modified on 12 August 2017, at 15:09.